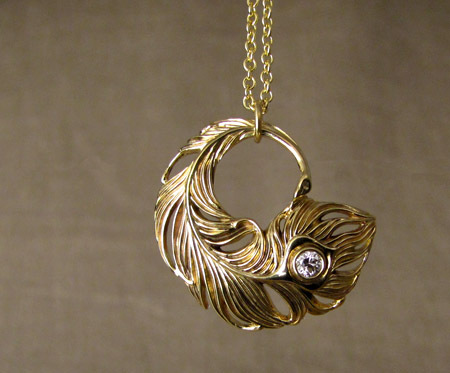 Hand-carved pendant with a swirl of feathery Rococo-style leaves. I absolutely love carving free-form pieces like this—not so much that the overall shape/design is free-form, but more the detail and contour on each leaf, which I just kind of got to make up as I went. 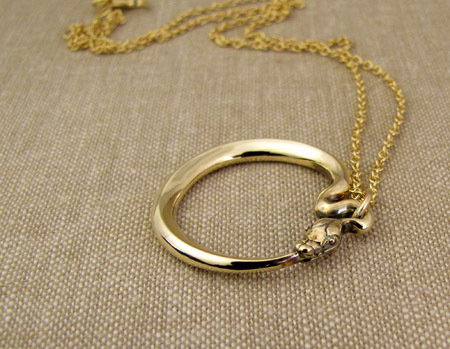 It’s in 18K gold with a 1/4 carat diamond dewdrop. Or maybe a moon rising through a break in the trees. I keep changing my mind.. 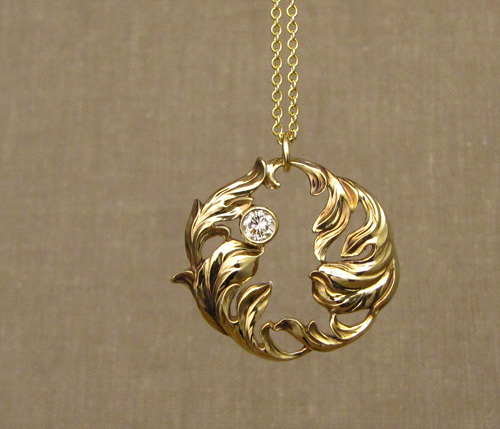 This one above is 18K yellow gold with a vintage 3mm (.11ct) Old European cut diamond (on an 18K, 18″ chain). This is currently available right now for the next few days, and then I’ll bring it up to the shop in downtown Portland. 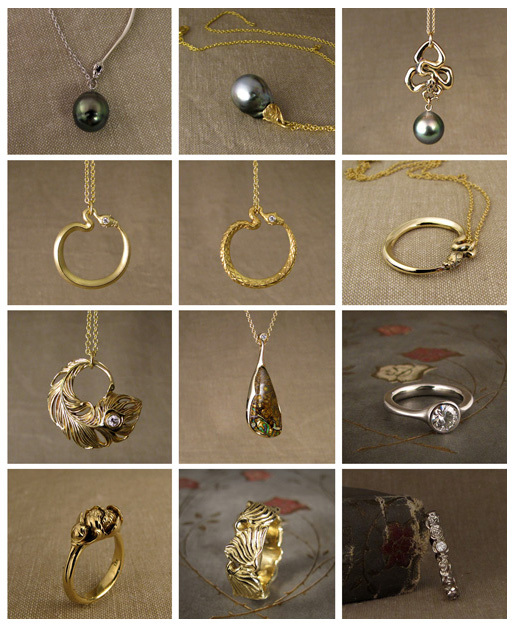 I can, of course, make a customized piece for you with any of the above alterations I mentioned (or not!). Send me a note: cheyenneweil@gmail.com . 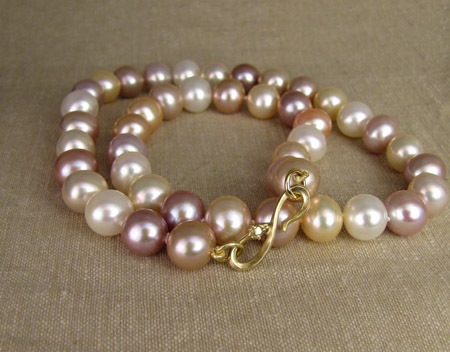 The necklace I have this with is a Tahitian & South Sea keshi necklace with larger round silvery Japanese baroque akoyas (pretty unusual color for akoya pearls). 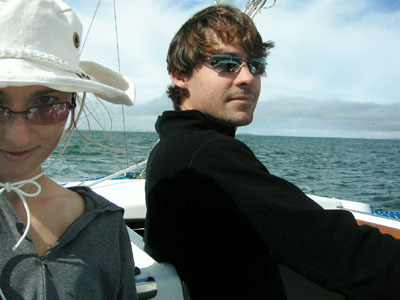 The creamy ivory color contrasts so nicely with the silvery blue. 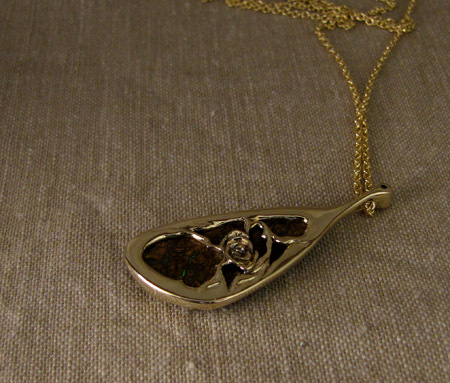 This is a second pendant I carved a bit back, but finally had the time to finish up and complete into a necklace. 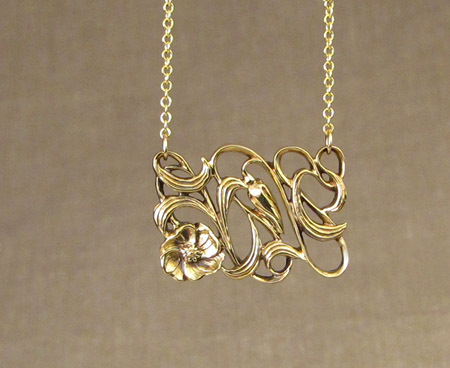 This is a limited production piece I can make to order (18K, 14K white, yellow, or rose gold, chain length, etc.). 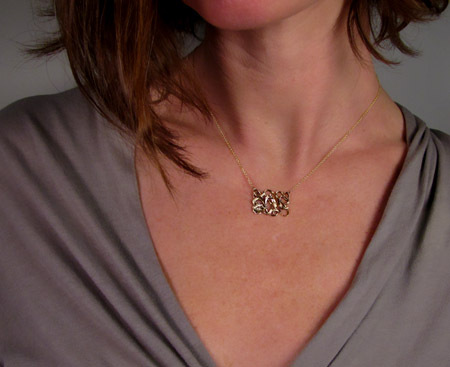 The pendant and chain are both 18K gold. The design is based off of an old Art Nouveau embroidery I saw a long time ago. 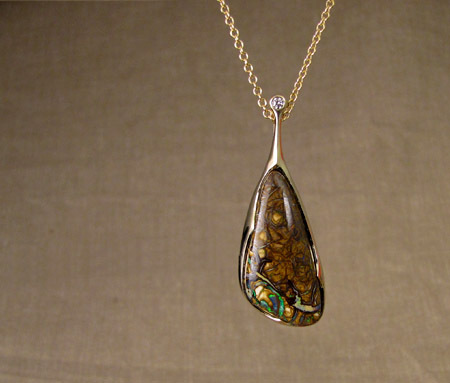 One-of-a-kind boulder opal pendant! It is so incredibly hard to get a photo that really captures how cool opals are. This one has little streams and tributaries of opal running around all the way up to the top of the stone—red to orange to yellow to green, with wider turquoise and purple rivers towards the bottom. Boulder opals are my favorite. I like that they look like some sort of aerial photograph of, well, unicorn-land or something. 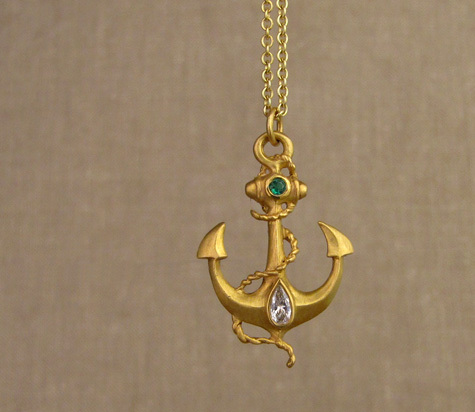 The stone up top is a little 2mm diamond, and pendant + 18″ chain are 14K gold. Of course I couldn’t bear to cover up the back of the stone, which also has little rainbow rivers and streams running through it, so I opened it up and carved a little detail here. I have this guy listed on Etsy. 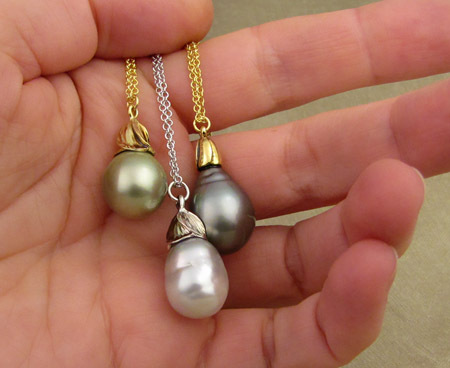 I made a new batch of pieces for the shop in downtown Portland: these lovelies are 18K yellow gold with Tahitian pearls (the giant gunmetal drop & the pistachio drop), and 14K white gold with a lovely white South Sea baroque pearl. I want to keep each new thing that I make. It’s so hard letting go! Here is another shot of the pistachio drop. I wanted to keep it. 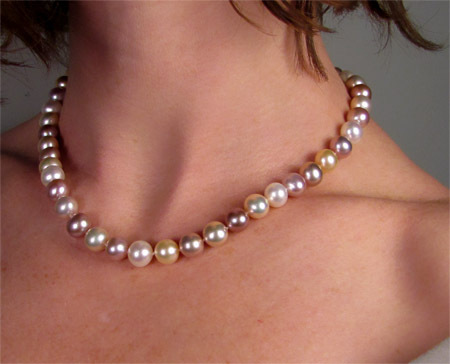 Multi-color peachy and pink freshwater pearls! These awesome jobbers are knotted on silk and attached to a carved snake S-hook because that’s just how I roll around here. AAAHHH! Can I keep them already?! New in the Etsy shop! 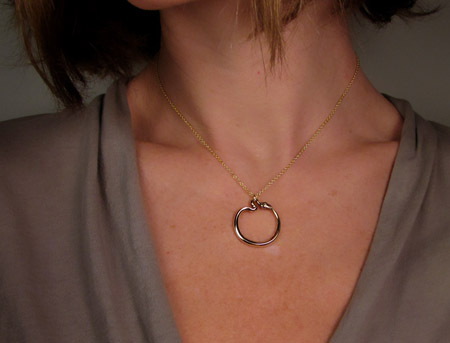 Hand-carved ouroboros pendant in 14K gold. 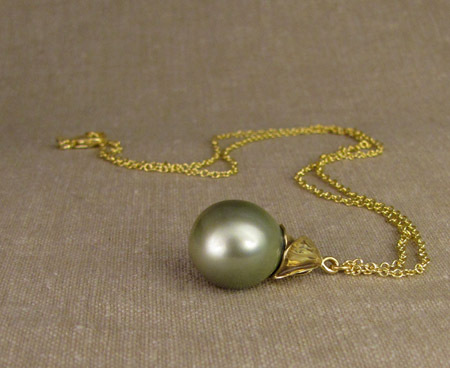 Comes with a solid 14K gold cable chain w/lobster clasp. I put this on to photograph and have been wearing it around all day. I love how he turned out!